Remember that scene from Inception where they fold Paris on top of itself like a pasty? Yeah, that's a thing you can do. 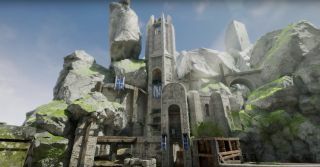 The Unreal Engine 4 editor now works in VR. Let me state that differently, because this is multilayered dream-within-a-dream stuff: the editor itself, as well as the games it produces, has a VR interface. This is one of the few videos that manages to convey the potential of VR second-hand. Epic's Mike Fricker has his head in a Vive headset, waving the motion controllers as casual and can be to reach out and manipulate objects in the development environment. Virtual rock in the wrong place? Pick it up and move it. Need to drop new assets into the scene? The libraries are brought up in an interface that apes a physical tablet. I'm sure you wouldn't be able to develop like this full-time without needing a neck brace, but the idea that devs can walk about their creations, manipulating the environment on a whim with natural motions is, well, god-like. I expect more than one auteur to be pulled emaciated from the rig screaming, "Put me back in! Put me back in! Release me, pathetic mortals—ph'nglui mglw'nafh Cthulhu R'lyeh wgah'nagl fhtagn!"